Oscar joined the Founders Space as a mentor. He is working with startups across three main areas: Experimentation, Implementation and Fundraising. As a founder of several startups, Oscar developed expertise in increasing the speed and quality of experimentation in search for traction. Oscar works with founders in designing experiments, outlining processes and key measurements. Based on experimentation results, Oscar assists startups by actively participating in implementation and custom sourcing relevant talent with a focus on lowering the cash burn rate to extend the runway for additional experimentations. Finally, for select startups that have proven the ability to gain traction, meet milestones, and grow a team, Oscar and his team lead the fundraising process so that founders can dedicate more time to advancing the business. Currently, Oscar is focused on working with startups that use technology to take advantage of the underutilization of physical assets and solve underemployment challenges. He is dedicated to supporting startups that actively participate in the revival of communities, repurposing of under appreciated assets, and elimination of waste. In recent years, he has been working with startups in real estate, lodging, and retail that have both local and global impact. 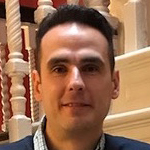 Throughout his career, Oscar has lived and worked in Romania, Germany, India, the UK, and the US advising clients on business process engineering and fundraising for almost two decades. He has worked with clients in real estate, lodging and retail with main operations in the US, Israel, China, and India. In his spare time, Oscar has volunteered with iMentor in New York, provided volunteer consulting for GNOME in Boston, and promoted the European Foundation for Entrepreneurship Research in Eastern Europe. Oscar earned an MBA at Harvard Business School and a B.A., with a concentration in International Business, from the Academy of Economic Studies in Bucharest. Guadalajara Golf Academy is a startup focusing on improving golf in México by Virtual Reality in a School After School concept for all socioeconomic sectors by using new technologies that measure results and facilitate teaching.